London has the worst air pollution in the UK and among the worst in Europe. Air pollution is a much bigger crisis than most of us have realised and regularly exceeds twice World Health Organisation (WHO) guidelines and legal limits near our busiest roads. Only smoking causes more early deaths than air pollution in the UK. In the Great Smog of 1952 there were 4,075 early deaths in London due to short-term exposure to ‘visible’ air pollution. Scientists did not know about the health impact of long-term exposure until about 10 years ago. Mayor Johnson has estimated – using the language used for alcoholism, obesity and smoking – that 4,267 deaths in London in 2008 were attributable to long-term exposure to ‘invisible’ dangerous airborne particles (PM2.5). The Committee on the Medical Effects of Air Pollution (COMEAP) has explained that the average loss of life for these people was about 11.5 years. In other words, there are as many early deaths from ‘invisible’ air pollution in London now as we thought occurred in the ‘visible’ Great Smog of 1952. The estimate of 4,267 extra or excess deaths is a good one for comparing the effects of air pollution with those of other causes of premature death such as alcohol, active or passive smoking, obesity, diet etc which are calculated in the same way. However, COMEAP has shown us that because, in practice, individuals experience multiple health risks, air pollution almost certainly played some part in shortening the life of a much larger number of individuals in London. It is not possible to estimate that number reliably but given that much of the impact of air pollution on mortality is linked to cardiovascular deaths, it is reasonable to consider that air pollution may have contributed to all 15,800 deaths in London (in 2009) due to cardiovascular causes (i.e. one in three of all deaths) at an average additional loss of life for these people of some three years (at typical ages for cardiovascular deaths e.g. 15% of which are before age 65). Separate research published in 2010 by the Aphekom group of scientists has shown that living near roads travelled by 10,000 or more vehicles per day on average could be responsible for some 15-30% of all new cases of asthma in children; and of COPD (chronic obstructive pulmonary disease) and CHD (coronary heart disease) in adults aged 65 years and older. The same study further estimated that, on average for all 10 cities in the study, 15-30% of exacerbations of asthma in children, acute worsening of COPD and acute CHD problems are attributable to air pollution. This burden is substantially larger than previous estimates of exacerbations of chronic diseases, since it has been ignored so far that air pollution may cause the underlying disease as well. Related research indicates that associations of asthma with traffic-related pollution from nearby sources at schools were independent of estimated effects of exposures at homes. Clean Air in London found 1,148 schools in London within 150 metres of roads carrying over 10,000 vehicles per day and a total of 2,270 within 400 metres of such roads. The Government has said that it won’t comply with air quality laws in London until 2025. This is ridiculous: Mayor Johnson said in 2010 it could be done by 2015. London must lead the world in tackling ‘invisible’ air pollution as it did after the ‘visible’ Great Smog of 1952 including delivering the ‘greenest Games ever’. This manifesto describes 45 measures in 12 key policy areas under these five themes. 10% to 14% close to the roadside it is expensive to carry out and PM10 concentrations will climb once again as soon as the treatments stop. ‘Off-setting’ is never better than reducing harmful emissions at ‘source’ and very local measures do little, if anything, to protect public health. Mayor Johnson has admitted applying ‘dust suppressants’ in the nearside lane by official monitors at the most polluted sites with the inevitable result that reported PM10 concentrations have fallen. Reform the congestion charge. Revoke exemptions for Euro 5 diesel vehicles. Offer exemptions to zero and ultra-low emission vehicles (e.g. electric and biomethane). Make the ‘polluter pay’ by charging vehicles more if emissions are high relative to others within a category (including CO2). Use hypothecated profits to ease the change for small businesses affected by the LEZ etc. Many UK cities, such as Portsmouth, are now setting default 20 mph speed limits for residential streets. 20 mph zones can directly cut air pollutant emissions by smoothing traffic flow – the highest emissions are generally seen from stop-start traffic conditions. However, perhaps more importantly, 20 mph zones provide a safer, more welcoming environment for active travel choices such as walking and cycling, a view endorsed by a 2009 London Assembly Report. Some London boroughs are already implementing such zones. Ambient or outdoor air pollution comprises particles and gases. The particles, which can comprise anything from tiny droplets to diesel soot and tyre and brake wear, are called ‘particulate matter’ and classified by their aerodynamic diameter in microns (one-millionth of a metre which is about one-hundredth of the thickness of a human hair) e.g. PM2.5 and PM10. The gases, which can coalesce and become particles, are mainly nitrogen dioxide (NO2), ozone (O3) and sulphur dioxide (SO2). The WHO says there is little evidence to suggest a threshold below which no adverse health effects would be anticipated for particulate matter. NO2 is a product of combustion processes and is generally found in the atmosphere in close association with other primary pollutants, including ultrafine particles. The WHO sets guidelines for annual mean and short-term exposure to air pollutants for the protection of human health. These are: 20 micrograms per cubic metre (µg/m3) and a daily mean of 50 µg/m3 for PM10; 10µg/m3 and a daily mean of 25 µg/m3 for PM2.5; and 40 µg/m3 and an hourly mean of 200 mg/m3 for NO2. The annual mean and short-term concentrations should not be exceeded. An Air Quality Framework Directive (Council Directive 1996/62/EC), covering ambient air quality assessment and management, entered legislation in 1996. It was followed in 1999 by a so-called First Daughter Directive (Council Directive 1999/30/EC) which set limit values for various pollutants including NO2 and PM10 and thresholds for assessing and managing air quality for the pollutants concerned. Since 1999 therefore, limit values to be attained and not exceeded: were an annual mean of 40 µg/m3 and not more than 35 days over 50 µg/m3 for PM10 from 1 January 2005; and an annual mean of 40 µg/m3 and not more than 18 hours over 200 µg/m3 from 1 January 2010 for NO2. In other words, the legal limits for PM10 are up to twice WHO guidelines whereas those for NO2 are aligned with WHO guidelines. In 2008, Directive 2008/50/EC on ambient air quality and cleaner air for Europe entered into force. Amongst other things, it set new standards for PM2.5 to be achieved by 2015 and 2020 and allowed Member States to apply for a time extension to comply with limit values for PM10 and NO2. Time extensions can only be obtained if a Member State meets strict conditions including demonstrating that compliance with the limit values will be achieved by the new deadline. The latest deadline possible for PM10 was 11 June 2011. After two failed attempts to obtain a time extension, the UK obtained unlawfully a time extension until 11 June 2011 to comply with the PM10 daily limit value in London after submitting an updated air quality plan to the European Commission without consulting the public. The good news for public health is that no further time extension or breach of the PM10 annual and daily limit values is allowed in London (or elsewhere). The latest deadline possible for NO2 is 1 January 2015. The Government has said it can’t (or won’t) comply with the NO2 limit values in London until 2025 and so is unable to meet a basic condition of a time extension i.e. to demonstrate compliance by no later than 1 January 2015. In fact, Mayor Johnson listed 14 measures in his Air Quality Strategy published in 2010 to show that the NO2 limit values could be complied with by 2015 if Government action and money was forthcoming. Even if a time extension for NO2 were to be obtained in future, another requirement of the 2008 Directive is that the limit value plus margin of tolerance must not be exceeded during the period of a time extension i.e. an annual mean of 60 µg/m3 and no more than 18 hours over 300 µg/m3. In any event, limit values for PM10 and NO2 must not be exceeded once attained. Clean Air in London is responsible for a cross-party campaign to achieve urgently and sustainably compliance with World Health Organisation guidelines for air quality throughout London. It works closely with other campaign groups and a wider network of supporters and volunteers to identify and build understanding of the most important issues and encourage decisive action on them. 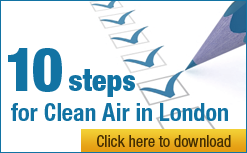 For more details about Clean in London including its supporters and sponsors see cleanair.london. Clean Air in London’s immediate priority is to see that air quality laws are enforced rigorously in London in 2012 and thereafter. Clean Air in London believes that if we comply fully with relevant laws London can show the world how to tackle successfully air quality, climate change and sustainability issues.